Beautiful imaginations, full of color. Tigers and Mardi Gras designs are so much fun! Welcome to Lisa's Face Painting! I am a professional face artist in the Austin, Texas area. I paint with MANY other talented face painting artists in the area and we look forward to painting a smile on your guest's faces. NOW OFFERING: Balloon twisting, and glitter hair. We can cover areas around Austin, Texas ( Temple, Killeen, Georgetown, Round Rock, Buda, San Marcus, Elgin, Bastrop, all of central Texas). We are willing to travel outside of the Austin area for a travel fee. Please contact us to find out if we cover your location, if your area is to far out we will try to recommend a suitable company that is in your area. We face paint for birthday parties, sports events, weddings, family reunions, corporate parties, school reunions, school and church events, etc. Face painting is for any one of any age. Let your imagination flow, you can become a fairy princess or transform into Spider-man or anything your imagination can come up with. 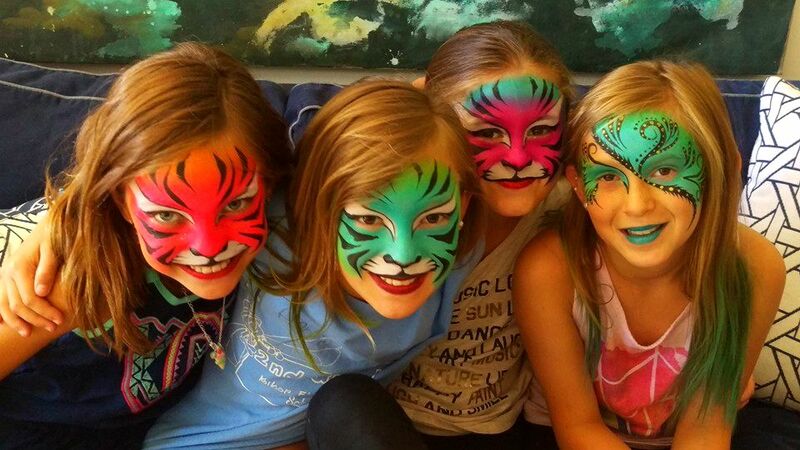 We use only professional face painting makeup that is non-toxic and easily removed with water. Our paints are FDA approved for the skin. We only use the best brands available. Face painting is always a huge hit whatever the occasion and we have a wide range of original and classic design ideas for kids and adults. We want to help bring a fun & memorable experiences to your next party or event! Our face painters are sure to please any crowd! We look forward to Keeping Austin Weird with our artistic creations. While painting smiles on the faces of children and those who are childlike at heart.